Five of the GFWC International Past Presidents at the 2015 GFWC Annual Convention in Memphis, Tennessee. For two years, the GFWC International President resides at GFWC’s Headquarters on 1734 N Street, located just south of DuPont Circle in Washington, D.C. It becomes her home as she invests all of her time into GFWC. Living at this National Historic Landmark is just one of the many duties required of the International President during her administration. Serving as the official representative of GFWC, each International Past President has left a truly remarkable mark on GFWC that is still felt today. From Charlotte Emerson Brown, GFWC’s first president in 1890, to Babs J. Condon, GFWC’s 50th President, the Federation has been led by inspirational leaders who ensured GFWC was meeting its mission of improving the lives of others through volunteer service. As Women’s History Month comes to a close, join us on a glimpse of the past as we look back on the accomplishments and contributions of just a few of the many International Past Presidents. These incredible leaders are true examples of Living the Volunteer Spirit. During her term, Mary Elizabeth Preston, the 32nd GFWC International President, promoted family unity and free enterprise. “The private enterprise system has been the financial pillar of our society, the family has been the moral and philosophical pillar. While they both stand, our country is held aloft and free; if they should fall, America falls with them,” she said. She also helped to establish the Korean Federation of Women’s Clubs, traveling to Seoul, South Korea in 1978. She then spent a week in the Soviet Union, along with First Vice President Juanita Bryant and Second Vice President Jeri Winger. In Moscow, the GFWC leaders met with leaders of the Soviet Women’s Committee and discussed the roles of Russian women. As GFWC International President, Marijo Shide worked to increase awareness of GFWC and encouraged clubs to put GFWC in their club name. “Clubs and State Federations saw the value of the GFWC Brand. If a reporter didn’t know what GFWC was, that gave them a great opportunity to tell them,” she said. Marijo promoted programs including crime prevention, energy conservation, the Community Improvement Program (CIP), CARE, and National Family Week. Marijo enjoyed interacting with clubwomen and having the opportunity to serve. She also loved living at GFWC International Headquarters and having access to the Archives. The opening of the GFWC Women’s History and Resource Center on May 1, 1984 was one of the highlights of Juanita Martin Bryant’s time as GFWC International President from 1982-1984. 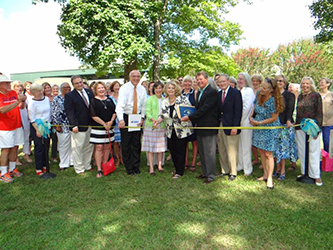 Vice President George Bush cut the ribbon at the opening ceremony, officially opening the center, which stores GFWC Archives and documents the history of women volunteerism. As a self-described history buff, Juanita is proud that the WHRC is still going strong today, and that it is used by individual researchers, universities, and historians. Working with the mentally and physically handicapped, especially through the Special Olympics, was Juanita’s special project during her administration. She attended the International Special Olympics in Baton Rouge, Louisiana in 1983. Another highlight of her presidency was attending the National Multiple Sclerosis Conference in Houston, Texas, where she presented the MS Volunteer Award to Frank Sinatra. Juanita also travelled internationally through the CARE project, visiting projects in Hawaii, Guam, South Korea, Taiwan, Hong Kong, Thailand, Bangladesh, Cambodia, India, and Saudi Arabia. Looking back at her administration, Juanita says that she enjoyed the opportunity to visit and meet with clubwomen not only in the United States, but around the world as well. “I feel very strongly that our volunteer work is a great contribution. It doesn’t trickle down from the top; it wields up from the bottom. The great success of GFWC is because it is organized not only in clubs, but on regional, national, and international levels. I think that is a major thing that has made GFWC so successful during this 126 years,” she said. As the 46th GFWC International President, Jacquelyn Pierce’s administration focused on Domestic Violence Awareness and Prevention. Participating in the writing of the Violence Against Women Act was one of the highlights of her time as president. Jacquelyn is proud of GFWC’s recognition in the United States Senate in 2006. Then-Senator Joseph Biden (Del.) called “a gem among our midst” for our work in domestic violence awareness and prevention, as well as GFWC’s history of support for the Violence Against Women Act. Jacquelyn had the opportunity to visit the Dominican Republic in 2007 with Reaching Out Internationally Chairman Nancy Jones, participating in the Plan USA Global Women’s Fund in Action. “It was a very humbling experience for me to be able to write a personal check in the amount of $800 which enabled the women of the village of Azuna to purchase their first commercial sewing machine so that they could make the school uniforms that their children were required to wear. Presented on behalf of GFWC, that small donation made a difference. The women could now be gainfully employed and the uniforms could be made at a cost much less than if purchased in a retail store,” she said. “I have always thought that if you looked at a banner in the front of a convention hall, the words on that banner should define, without question, the mission of the organization. To me, GFWC, first and foremost, empowers its members, and it does so on an individual basis. Ask any club member what GFWC means to them and their answer will involve their personal empowerment,” she said. Rose M. Ditto, Ph.D., served as GFWC’s 47th International President. Her administration focused on health programs, specifically healthy self-worth. As president, Rose enjoyed the opportunity to share her passion for the importance of the development of healthy self-worth and emotional intelligence. Serving with Missi McCoy, GFWC Director of Junior Clubs, the Executive Committee, and the GFWC Staff was another highlight. Rose also enjoyed attending GFWC Region, State, and club meetings and representing GFWC at events. “Through my travels to GFWC Regions, States, and Clubs, I was always amazed by the projects and volunteer achievements proudly reported,” she said. The volunteer spirit and the giving nature of GFWC members have impacted the American spirit and culture which have reached all over the world, Rose said. “At one time the voice of GFWC was very strong and quite influential, however, as our membership has lessened, so has our voice. The challenge now is to continue impacting those around us and within our reach—families and communities. The American dream is just not to have more, but to give more for the betterment of others,” she said. Mary Ellen Laister strongly supported the GFWC Signature Project: Domestic Violence Awareness and Prevention and the Success for Survivors Scholarship. In 2013, GFWC awarded eight scholarships of $2,500 each for a total of $20,000. Mary Ellen is proud to have raised over $20,000 in 2012 and 2013 to award these scholarships. Reading the applications and hearing the stories of these women was an emotional experience. “When I read those applications, I wanted to cry, I wanted to scream. It gave you every emotion in the world,” she said. Mary Ellen met one of the scholarship recipients during her administration, and said the young woman was so grateful that it brought tears to her eyes. “It was so important that we made their life better,” she said. According to Mary Ellen, the most exciting part of being president was traveling to the Regions and attending State Conventions, which allowed her to meet clubwomen and hear about the impact they were making in their communities. “It’s a once in a lifetime opportunity and I was very fortunate to be the 49th president,” she said. The Red Dress Fashion Show at the 2013 GFWC Annual Convention in Hollywood, Florida was a huge hit, Mary Ellen said. “I felt I had a very positive two years,” Mary Ellen said. For a full list of GFWC’s International Past Presidents, click here. Stay tuned for a look at GFWC Past Directors of Junior Clubs on the GFWC Facebook Page.